Just off Soi 88 in a completed housing development, this is the perfect location: within a secure project surrounded by nature, but still only 10 minutes to town center. 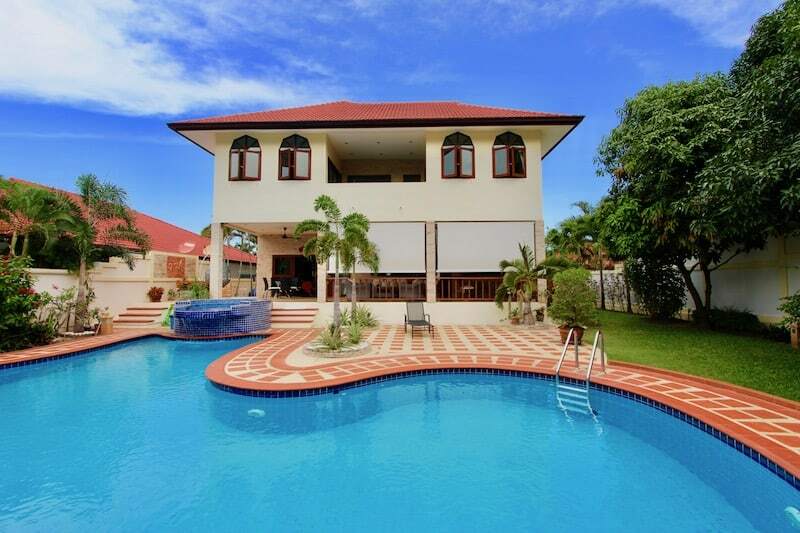 The home has a spacious outdoor living area, including a 9 x 4 m saltwater swimming pool with waterfall feature; a large covered terrace with ample room for dining; a covered sala with a full set of outdoor lounge furniture; and a low-maintenance garden with automatic irrigation system for added convenience. The interior living area consists of 2 floors: on the main floor is the kitchen, laundry room, living room, and 1 large bedroom with en-suite bathroom. The second floor has 2 more bedrooms, 1 bathroom, and an office/study/meditation room. The kitchen is concrete construction (solid) with tiled exterior and granite countertops. There is a double fridge freezer, electric stove, microwave oven, and breakfast bar with 4 seats. The living room has a tiled feature wall; floor to ceiling windows (with fly screens for added comfort); high quality curtains; cozy and modern furnishings; and recessed ceilings with LED lights. The master bedroom is on the main floor and enjoys a granite feature wall, an en-suite bathroom with walk-in shower, and a wardrobe. Upstairs there are 2 guest bedrooms, sharing 1 bathroom. The first guest bedroom has access to the balcony, which overlooks the gardens and agricultural land behind the house. From the balcony, the office/study/meditation room is accessed. This room is finished out to the same high standard as the rest of the house, and would be a perfect retreat to enhance creativity or uninterrupted concentration. Both guest bedrooms have king size beds, wardrobes, granite feature walls, and lovely cove ceilings. The property is sold fully furnished with high quality furnishings. The development has 24 hour security, a large communal swimming pool, and just outside the project are several options for local Thai food, laundry, shops and other convenient amenities. The land is full Chanote title deed and can be owned freehold or leasehold. For more information and to schedule a viewing, please contact Executive Homes Hua Him at +66(0)85.264.2158.